Last week, the kids and I flew from New Jersey to SeaTac while Darren stayed behind to move all our stuff from NJ to the NW. I was nervous about making the trip by myself, but we had a great time. People helped us each step of the way - checking baggage, through security, on the plane, gathering luggage. God blessed us with wonderful people to assist us every time we needed it. On our first flight, the pilot was so friendly. 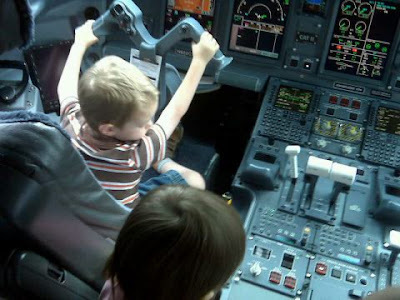 After the flight, he invited Joshua to sit in the cockpit. Abigail was a little disappointed that she didn't get to fly the plane, too. I'm sorry I didn't get to see you before you left. I'm glad the flight went well and hope the rest of the summer continues to go smoothly! 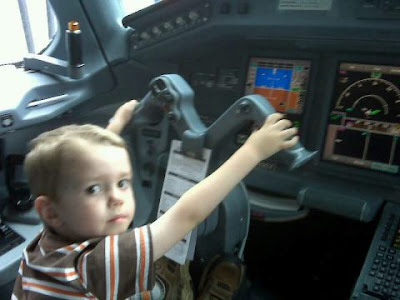 It is so nice when they let kids in the cockpit like that! They always have such a great time.